A most unusual upright tree, the Tassel Flowering Cherry tree (Prunus litigioa ' Tassel Cherry') produces clusters of attractive small white or pink-tinged flowers in April. These flowers have conspicuous protruding anthers, hence the reference to tassels. Good autumn colours, the Tassel Cherry was first introduced in China. 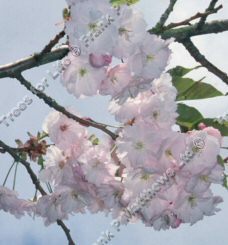 The Tassel Flowering Cherry tree is supplied at a height of between 150 and 200cm in a 7-12 litre container for year round planting and better results than from either bare-root or rootballed stock.